In line with Fondation Louis Vuitton’s commitment to contemporary creation and encouragement of innovative encounters with its architecture, as of 11 May 2016 the Fondation Louis Vuitton will present a temporary work by Daniel Buren. Developed in close dialogue with the building by Frank Gehry – whose architecture serves as an inspiration to artists – “Observatory of Light” will be installed across the glass ‘sails’, the emblematic feature of the building, states the Fondation Louis Vuitton. The twelve ‘sails’, formed of 3,600 pieces of glass, will be covered by a staggering array of coloured filters that are in turn punctuated, at equal distances from one another, by alternating white and blank stripes perpendicular to the ground. The thirteen selected colours will make coloured forms appear and disappear, ever-changing with the time of day and the season. Through a play of colours, projections, reflections, transparencies and contrasts, both inside and outside, Daniel Buren will show this building in a new light. 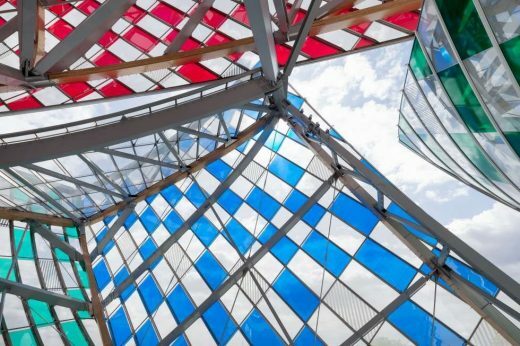 “Daniel Buren has designed a grandiose project, pertinent and enchanting, the result of a real dialogue with Frank Gehry and his building. His work responds magnificently to the architecture, in line with his approach, going back to the 1970s, that sees a coming together of colours, transparency and light.” Bernard Arnault, President of the Fondation Louis Vuitton. The Foundation Louis Vuitton will open its doors to the public on Monday, 27 October 2014. The building, designed by architect Frank Gehry, will become a new location in Paris for contemporary French and international artistic creation. 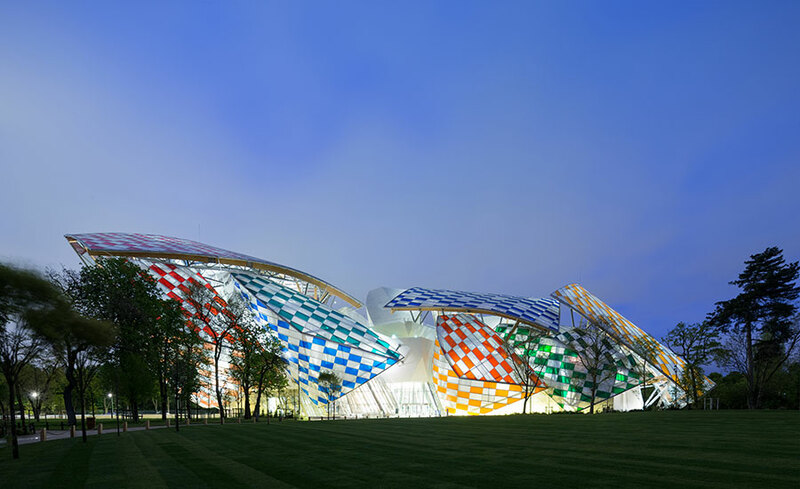 The LVMH Group announces the opening to the public on Monday 27 October 2014, of the Fondation Louis Vuitton. The Foundation will be located in a building commissioned by Bernard Arnault, and designed by the American architect Frank Gehry. Resembling a cloud of glass, the building is set in the Jardin d’Acclimatation in Paris, in the northern part of the Bois de Boulogne. The Fondation Louis Vuitton’s mission is to encourage and promote contemporary artistic creation both in France and internationally. The collections and programmes will continue the tradition of artistic and creative movements of the 20th and 21st centuries. The building for the Fondation Louis Vuitton includes exhibition galleries dedicated to the permanent collection, temporary exhibitions and artists’ commissions. It is completed by a flexible auditorium for the presentation of multi-disciplinary performances and events. Its terraces offer unique panoramic views of Paris and the lush greenery of the Jardin d’Acclimatation, the inspiration for Frank Gehry’s architecture of glass and transparency. 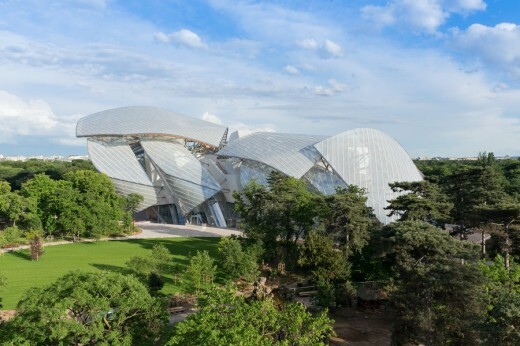 In the context of the opening programme, the Fondation Louis Vuitton will present an exhibition showcasing the architectural project created by Frank Gehry for the foundation. The exhibition will be presented in dialogue with the first European retrospective of Frank Gehry’s work presented by the Centre Pompidou, from October 2014. 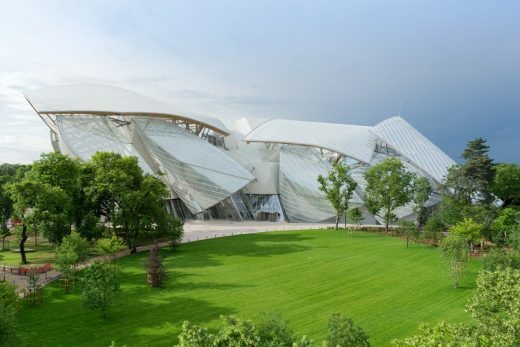 The Foundation Louis Vuitton is a corporate foundation and a private cultural initiative dedicated to art and artists. The foundation represents a new phase in art patronage and in the culture initiated by LVMH in France and around the world over the past two decades.